One in five older adults experience mental health concerns that are not a normal part of aging – the most common of which are anxiety or mood disorders including depression*. Focus on your emotional and cognitive health with regular physical activity. While physical activity produces chemicals in the body that promote emotional well-being, inactivity can make depression, anxiety, and stress worse. Focus on your emotional health by staying in touch with friends, family, and the greater community. 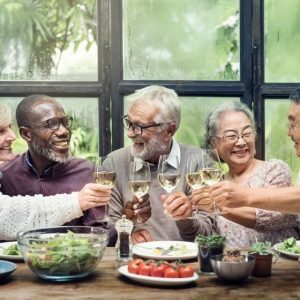 Whether physically healthy or ill, people who feel connected to others are more likely to thrive than those who are socially isolated. Focus on positive thinking to help you live a longer, happier life. Positive thoughts can create real value in your life and help you reduce stress. Positive thinking and optimism on health can lower depression, improve coping skills during hardships and time of stress, and your psychological and physical well-being. FirstLight Home Care Companion and Personal Care services are designed to support older adults and their families. We provide solutions to home situations that could be impacting the mental and physical well-being of an aging parent, like transportation. Our professional companion caregivers can provide transportation to get them out of the house and into a new environment. We transport our clients to appointments or help them with local errands and get them to social events and gatherings to keep them connected, active and engaged. May is National Mental Health Month. The month-long campaign is to raise awareness and start conversations about mental illness and its impact on the young and old. Join the conversation about aging mental health on our Facebook page. Great tips on staying active to avoid anxiety and mood issues as we age.